Really looking for an AIO cooler for 6600K and this seems to really fit my needs. I love the X2 as it now uses more acrylic so you can see actual water flow on the CPU block itself. Also the clear tubes are a nice touch from the previous black. Although, its a bit weird that this product is hardly sold on Amazon and the reviews it does actually have seem to be awful. I have seen great results with YouTube reviews but I was wondering if anyone here actually uses this product? Thoughts? Is it quality? And is the prestige even worth it or is the X2 just fine? It's a nice kit for the price you pay, performs a bit better than the comparable AIOs but with considerably less noise. The prestige has better fans, not sure if they are worth the additional price. You could probably buy the cheaper version and buy two EK Varder F4-120ER or Cryorig QF120 Balance fans and I'd guess they would work as good or better than the ELoops for less money than the prestige. I've used the Cryorigs on a high FPI Corsair radiator and even on that they work exceptionally well and are very quiet, and cheaper than the Varders as well. IMO these are the best price/performance/noise fans I've used. I'd also recommend draining the Swiftech before even using it and replace with some distilled and biocide or your choice of suitable coolant. Mine had tons of gunk in it and it almost completely choked the waterblock channels after a couple of months (glad I checked it). I7 6700K with a $20 Zalman CNPS14X will smoke an i5 6600K with any water cooling system. Until you step-up to an i7 6700K/5820K/6800K, you should not spend $100-150 on a cooler. Newegg has a $60 Corsair H110i GTX Extreme Performance. When AIO CLC goes on sale, it starts to make sense but not at $120-150 for an i5. If you want a very quiet system, there are quieter air coolers out there for half the price. Thermal right Macho or True Spirit 140 cost $45-55 and are miles quieter while more than enough for an i7 6700K @ 4.8Ghz. If you want a very quiet system, there are quieter air coolers out there for half the price. I kind of agree with Russian here. Go 6700K and a less expensive cooler over a 6600K and semi-exotic cooling anyday. If budget isn't a constraint and you simply want liquid cooling for the 6600K anyway, go for it. Even if you go CLC like a Corsair unit though, I'd still recommend one of the fans above, the Corsair units sound like crap unless they have improved quite a lot in recent units. I'd only recommend that Swiftech with a desire to expand to water cooling the GPUs. The issue here is that a 4.6Ghz i7 6700K would own a 4.7-4.8Ghz i5 6600K. There is also the upcoming I7 6800K 6-core. "Modern Intel CPUs run at full speed (including the full Turbo Boost allowed based on the number of cores and workload) all the way up to 100 °C"
Unless you plan on keeping the CPU @ 100% load for 24/7 for 20 years, there is no benefit (other than possible but not guaranteed 100-200mhz OC headroom over air) to running it at 40C vs. 90C. I've had my Ivy i7 3635 run @ 91-93C since February 2013 and it works perfectly. The fear of high temps for Intel CPUs is overblown. They are built like tanks -- besides you get 3 year warranty. These are interesting observations and I thank you for the link. I'd only be interested in an AiO if I planned with great determination to overclock -- which I do for my own systems, not for the fam-damn-ily nor for my server. My sig-rig shows me as a has-been clinging to six-year-old CPUs, although we'll have two IB systems after I build the second one as either an additional or a replacement server. It seemed to me, when overclocking the SB-K processors, that I would reach my self-imposed voltage limit before my temperatures exceeded 80C, and further cooling improvement brought the benchmark stress temperatures down to 75C and below. If I want to get the clock higher by 100 Mhz, I have to exceed that voltage limit. I really don't think it's worth the trouble. 4.7Ghz is just fine. Well noise is an issue for sure and I thought the H220 X2 was by far the most quiet AIO, are you telling me an air cooler would be my better option here? Also I'm confused on why you keep saying the i7 would "smoke" an i5. I don't do anything super intense beyond gaming, as in I don't "render" or "produce" anything and I was under the impression that thats where the i7 really outshines the 6600k. I would like to save that money (by purchasing the i5 over i7) and invest it into a new GPU. Off the top of your head, what are your recommended coolers for AIO (if at all) and what are your recommendations for air coolers? So what are you saying that you use for cooling yourself. Custom loops just aren't an option for me thats why I was leaning the AIO route. It is the quietest as far as I know. Air isn't going to be a better cooling option, air and a 6700K for a similar price perhaps would be a better overall solution though. I think what Russian is eluding to is increasingly games have started to show improvements with more than four threads. I have my 2600K cooled by an NH-D14, and the 2700K also @ 4.7 Ghz uses an EVGA ACX (formerly, "Superclock"). The coolers are ducted, which can reduce temperatures another 5C for a CPU reaching a thermal wattage of around 115W. I use GT AP-30 PWM fans for the rear exhaust of each. The ducting has a few layers of Spire foam-rubber acoustic pad on the outside, limited by only what will fit within the computer case. I don't run these exhaust fans beyond ~3,200RPM, even though their top-end is 4,200. My attention to the acoustic muffling eliminates most of the noise except for the white-noise "whoosh" of the exhaust air. I was looking at a couple AiO's, while keeping the option open for custom-water. One of these was the EKWB Predator 240. The 360 model offers the possibility of expansion, but I'd have trouble fitting it into a case like the Corsair C70. There are misgivings about whether the Predator 240 would fit in that case, so I'm also looking at the Corsair Hydro H115i -- which is listed as compatible with the C70 by Corsair. I spend more in chump-change here and there on this hobby than I might otherwise do. A purchase like the Predator or the H115i might seem a bit over the top, but I have enough curiosity and OC-determination that I simply count it as "part of my addictive hobby." But if a 6700K represents a 30% improvement over an SB-K -- stock-to-stock comparison -- I'm just wondering what sort of OC result I'll get with an air-cooler. I'll probably install a CM Hyper 212 EVO just for testing the parts, and I might get a chance to find out. But it's always easier if you choose the right parts to get them into the case from the beginning. And I'd really like to use the Predator cooler, but I'd also like to fit the entire enchilada in a C70 case. Building a new top-end machine is a very deliberate process for me, and I may wait several months before I pull the string and push the checkout button(s). The other problem that infects my thinking is "fondness:" fondness for a rig or two which you tweaked over a handful of years to achieve total perfection in its simplicity, despite the 6-year-old CPU technology. XSPC ION Pump/Reservoir $59.99 - This is actually an awesome little unit for the money with a versatile mounting bracket and it looks fantastic. It's not incredibly powerful so I wouldn't recommend it for a very lengthy or restrictive loop runs but if you keep the run tight it will do the job. Magicool Pro Slim Profile 2X120mm Radiator $32.21 - You could fit two of them for additional thermal margin. XSPC Raystorm CPU Waterblock V3 $49.99 - Or whatever block tickles your fancy. Swiftech Helix 120MM PWM $5.95 each - There are of course better fans, but these are cheap and quiet. $154.09 for a minimal custom loop, or if you go all out dual radiator and push/pull on both, $222 even. It would be easy to add a small DDC pump downstream from the ION as well later if you felt the need for additional flow/head pressure or even just for redundancy. Yes, a lot better because you are starting off with an inferior CPU. The best air coolers (Macho series from Thermalright) are all quieter than AIO CLC you are choosing, while costing $100+ less. That $ is better spent on a faster CPU/graphics card/better monitor. You aren't saving any $ buying an i5 6600K + a $150-200 AIO CLC because a $100 more expensive i7 6700K with any great $45-60 air cooler will destroy that i5 6600K in games. Such a cooler will allow a 4.8Ghz overclock on the i7 6700k, assuming the CPU is up for it. So what's the added benefit of a $150-165 H220 Swiftech AIO system? Waste of $ to say you have water in your rig. Here is a link to a post from our other sub-forum that shows clear difference between an i5 6600K and i7 6700K that cannot be overcome by overclocking i5 6600K to even 5Ghz. This is with a 980Ti. None for AIO CLC unless you find a deal on the Corsair H110i GTX Extreme and use it in Quiet Mode. There is no solid air cooler that cannot max out an i7 6700K, nevermind an i5 6600K. Literally any of these air coolers + i7 6700K is a better gaming system than any AIO CLC for $100-200 + i5 6600K, unless you can find H110i GTX for $60 again. Well, $154.09 plus six 3/8" barbs + clamps + tubing + (possibly) a fan splitter. The biggest benefit you might see to that is it is easier to fill than topping off an H220 X2, but for the extra $30 it would cost you over the H220-X2 that's not likely to perform any better. The pump in the Swiftech units is actually quite good; it has more head pressure and flow than the one in the XSPC combo, and you get the added bonus of PWM control. Russian, does this look like real world test conditions to you? Looks like an open air bench to me. He was concerned about fitting the odd dimensions of the EK Predator in a Corsair C70, not the Swiftech. That's fine. I can link a lot of reviews that prove my point. Akasa Venom Medusa vs. high-end AIO CLC in a case. The competing higher end AIO CLCs look like a waste of $ in comparison. That's a $50 air cooler. Look at this, $60 Phanteks with a 6-core CPU using way more power than Skylake. No problems. 100-200mhz extra is the most realistic scenario for the $100-200 AIO CLC over a $45-60 air cooler; and that's assuming the CPU doesn't crap out at 4.6-4.7Ghz in the first place as not all i5 6600K CPUs can reach 4.8Ghz. But he wants to buy an i5 6600K, not i7 6700K/upcoming i7 6800K or even the i7 5820K. It's one thing to buy a liquid cooling system for flagship CPUs, and totally another on an i5. 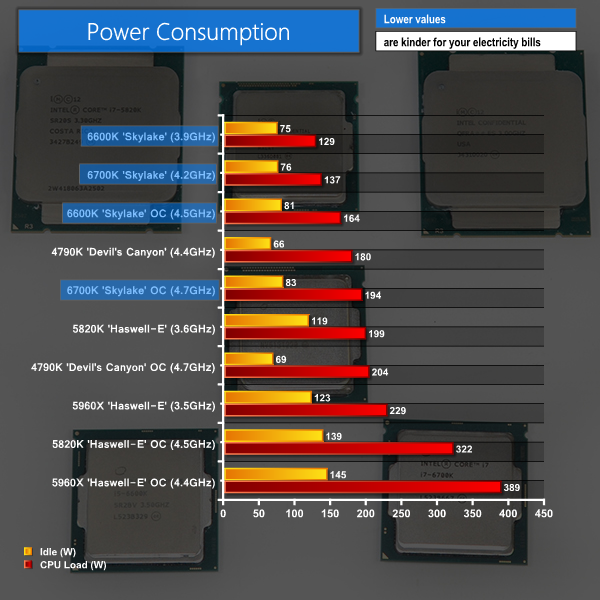 A max overclocked i7 6700K uses less than 200W of power. I guarantee it that a $20 Zalman CNPS14X will max out an i5 6600K @ 4.7Ghz without a sweat. It would be a cakewalk actually. Even at only 800rpm, this $20 air cooler is enough to keep an i7 3960X @ 4.375Ghz. i7 6700K + $20 Zalman CNPS14X >>>> i5 6600K with any CPU cooler in the world. AIO CLCs have their place but in the OP's case, this isn't one of those situations. As I mentioned before too, i7 6800K 6-core BW-E is launching in a matter of weeks. That CPU @ 4.5Ghz with that $20 Zalman heatsink is also a better choice to keep as a primary gaming system for 5+ years vs. a i5 6600K. In CPU limited sections of Fallout 4, Crysis 3, The Witcher 3 and Assassin's Creed Syndicate, etc. even a max overclocked i5 6600K approaches 90-95% CPU usage, leaving almost no headroom for future more demanding games. Why buy an i5 and an expensive cooling system when even a 4.6Ghz i5 6600K is nearly maxed out in some games? The part here that makes no sense is that running an i5 6600K OC at 40C or 90C makes no difference to its longevity or performance under real world conditions. That's what the companies trying to sell us $150-200 cooling systems don't want us to know. OTOH, there is a tangible benefits to a 4C HT i7 6700K or upcoming 6C i7 6800K for games where you are CPU limited (need higher minimum FPS). Where AIO CLC or custom loop excels is the situation of overclocking 320W+ CPUs (X99 series) or in cases where you cannot fit the air cooler into a small case in the first place. Otherwise, air cooling wins hands down.